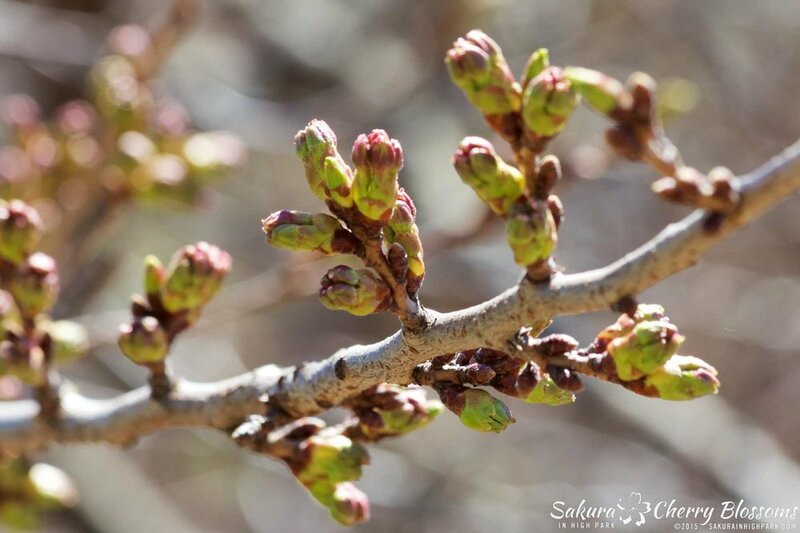 Sakura Watch, April 28, 2015 - florets begin to show in the grove of trees near the sports fields while other buds still lag behind in other sections of the High Park. Walking through the park today showed just how much the trees near the sports fields and along the road towards Grenadier Cafe have genuinely moved on to Stage 4 of bud development. To elaborate, Stage 4 is when the buds begin to change into elongated florets - which are what will eventually be the flower petals of the blossoms - and are represented with a deep, pink colour on the tips. These florets will eventually grow deeper in colour as they stretch out of the bud and create the first cherry blossom to have a bright pink colour before they are fully open and fade to white. 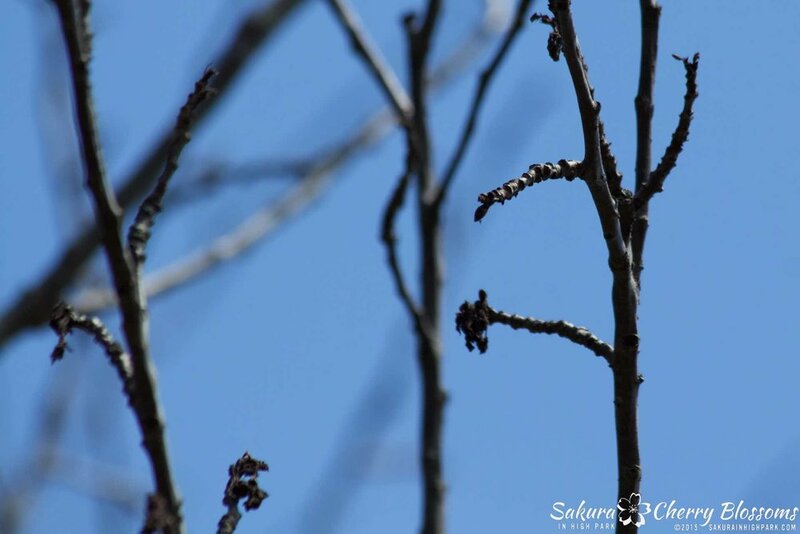 The grove of trees along the hill and winding path toward Grenadier Pond are a mixed bunch at the moment with 50/50 round buds vs buds with florets seen throughout the trees. In fact walking along the path by the pond you can see the trend continue as many of trees are still only smaller round buds. The plus side to this is that they will tend to bloom a bit later then the other flowers give an extra a day or so of viewing for all of us. Problems with some sakura trees? As seen in the photo here, it seems a handful of the sakura // cherry blossom trees are either showing partial sections of dried up branches with shrivelled buds to a few trees that look entirely dead. The most concerning and sad to see sight was upon taking a closer look at some of the trees near the Adventure Playground and High Park Zoo. I know the collection of smaller trees that were planted a few years ago are all but gone now, with only one survivor - and even that poor sakura is barely holding on. I hope that this isn't a sign of this grove of trees falling to disease or vandalism or some other unknown cause. The trees that do show signs of buds are still tiny and mostly closed as compared to the other areas in the park. I'm predicting that this section will once again be a more sparse display of blossoms mixed in with plenty of leaves as was seen last year. 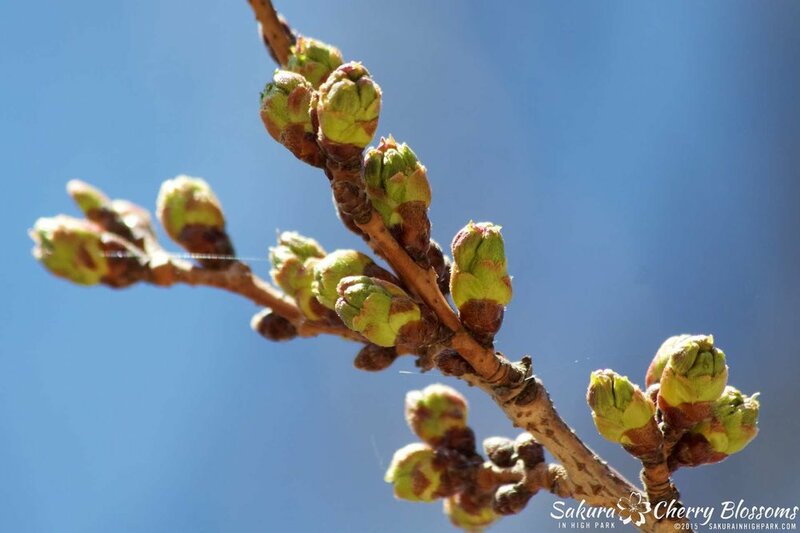 On a happier note, we are now getting closer to seeing the sakura // cherry blossoms bloom - watch for more updates later this week as we head into May and the 2015 bloom!